Amazon (NASDAQ: AMZN) just released a new software program called Send to Kindle that makes it easier to send most printable documents to both the e-ink Kindles and the Kindle Fire. I downloaded the new “Send to Kindle” app on to my Kindle Touch with ease using the detailed instructions that Amazon provides and the prompts from my browser. Right now this program is only available on Windows, but a Mac version is coming soon. Once downloaded, you can access the application in two ways. 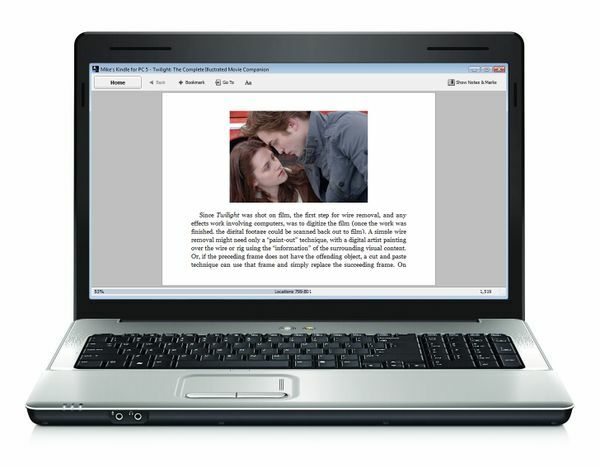 Through Windows Explorer, you can right click on the document and select “Send to Kindle”. You can also go into a program such as Microsoft Word that supports printing and select “Send to Kindle” from the list of printer options. To test it out, I sent my resume to my Kindle. It appeared on my home screen within seconds, and formatted nicely to fit the screen. Just make sure the Wi-Fi or 3G access is enabled. Something like this is much more useful for sending documents like articles set up as a PDF that would be easier to read on the Kindle than the computer. I could have used this during graduate school when all of my classes required reading a lot of PDF articles. The Send to Kindle program is also great for storing documents and can be used to email the documents to contacts on your pre approved contact list. Instructions on how to manage your Kindle’s email address are available as a link from the Send to Kindle page. Just search for send to kindle in the AMazon search box. 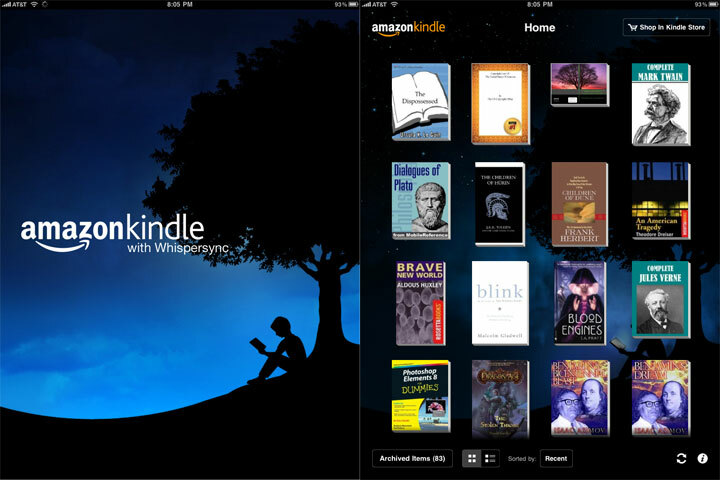 Send to Kindle works on all Kindles and devices that support it such as the iPad, iPhone, and iPod. There’s no mention of Blackberry or even Android yet. As with all of your other Kindle content, any documents you send to your Kindle is stored in the archives for retrieval from your Amazon account anytime. 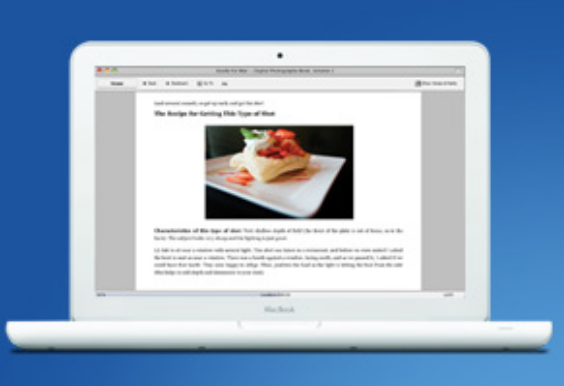 Send to Kindle also saves your last page read, bookmarks, and highlights and includes the ability to sync across devices. With such easy access to portable storage and unlimited cloud storage, there should be no more excuses for losing a document again. So much for the “the dog ate my homework” excuse. Kindle for iPhone or iPod touch gives you about all of the features you can get on a regular Kindle or Kindle DX. You can download any of the books from the Kindle Store, sync to pages and adjust the font. Kindle for iPhone or iPod touch uses a backlit screen so you can read your book in the dark if you want to. 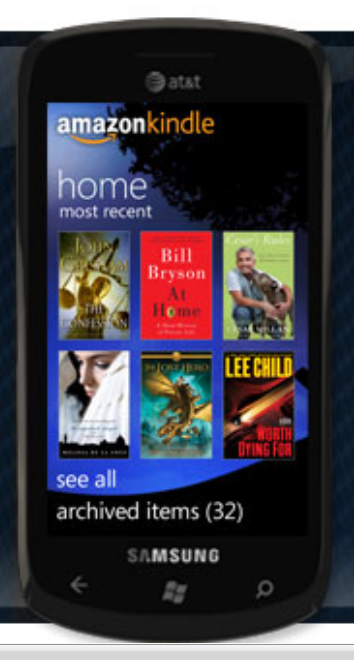 The home screen allows you to sort your books by recently added, author, or title. Additional features include the ability to download the book in the background for IOS 4.0 devices, read free and out of copyright books from Project Gutenberg and other similar sources. For a more comprehensive list of features go check out the Kindle for iPhone page on Amazon (NASDAQ:AMZN). To install: Search for Kindle for iPhone in the iTunes App Store on your computer or on your iPhone or iPod touch. Get the latest version: 2.5.1. The Windows PC Kindle Application allows you to read your Kindle books on your computer. It includes full screen color and brightness adjustments, the ability to sync annotations and last page read, and you can search for all books available in the Kindle Store. Windows XP Service Pack 2, Vista and 7. Most PC’s nowadays fill these requirements easily. To install: Click “Download Now” on the Kindle for PC product page and the installation should begin automatically. If it doesn’t, Amazon provides you with a page that gives you a link to try installing it again. Kindle for the Mac does has most of the same features as Kindle for PC except that the Kindle for the Mac just allows font adjustments. To install: You can install directly from the Kindle Mac Application Product Page, or you can install from the Mac App Store. To install: Sign into your Amazon account and send an email to your Blackberry or download directly from your browser at “amazon.com/kindlebb”. This is the only app that is available to just U.S. customers. The Kindle for iPad Application is the same as the application for the iPhone, but on a larger device. It also includes Kindle Audio and Video. Software requirements: iPhone/iPad 3.2 OS software update. To install: Download Kindle for iPad from the iPad App Store. 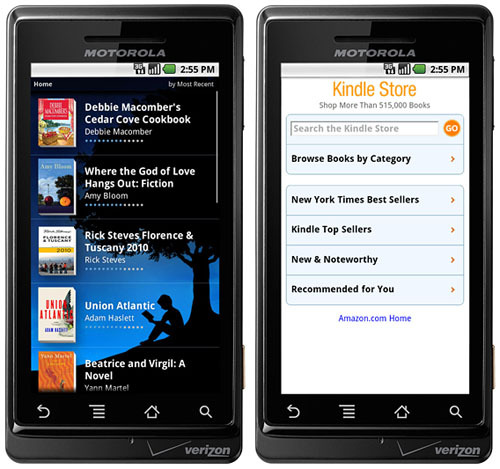 Kindle for Android users can share reading progress, read in landscape or portrait mode, zoom in with a double tap and read over 100 magazines and newspapers in addition to the 810,000 books in the Kindle Store. To install: Search for “kindle” in the Android Market or use your phone’s sensor to capture the Kindle for Android Application barcode on the product page. The Windows Phone 7 Kindle application has 5 different font sizes and 3 background colors to choose from. You can also email a link to a book you are currently reading or one from your library to a friend. 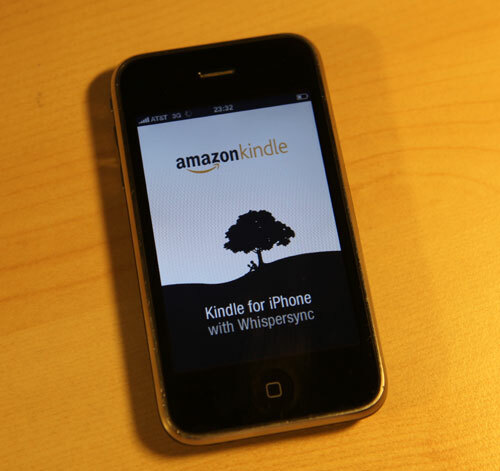 To install: Download the Windows Phone 7 Kindle application from the Windows Phone 7 Marketplace. Mashable is a leading social network news blog that was founded in 2005. You can get it on the Kindle and Kindle DX for 99 cents a month. By downloading the site to your Kindle, you can read it anytime with or without the wireless capability. Just keep in mind that the wireless needs to be on in order for the content to be refreshed. Peter Cashmore founded the site from a small town in Scotland. 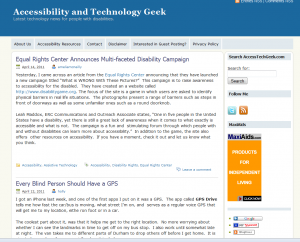 The site includes up to date news on social media such as Facebook, Twitter, blogs and Web 2.0 trends. This is a great resources for libraries because libraries are constantly striving to stay on top of the technology curve. In addition to libraries, this site is popular with entrepreneurs, social media enthusiasts and pretty much anyone who is interested in Web 2.0 trends. Some recent news topics include the newest iPhone apps. There is an article about an interesting looking case that makes the iPhone kid friendly. Another article discusses the ease of using the iPhone to swipe a credit card. If you are an Android user, there is news for you too. 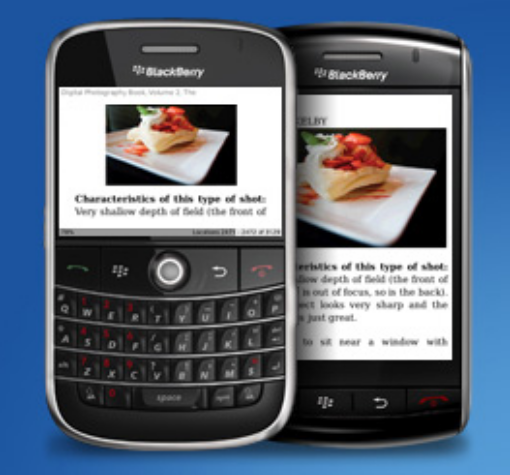 Of course, you can also find news on the Kindle, Nook and other e-book readers. Social Media Marketing is a big deal right now, and Mashable is an excellent resource for finding suggestions on how to market yourself on Facebook and Twitter. Marketing your business on these sites helps get your brand out there and is also a good way to network with people in similar fields of expertise. Looking beyond social media, another good technology blog to consider is TechCrunch. TechCrunch was founded in 2005 and profiles start ups, shares the latest technology news and reviews new internet products. Some of the latest articles include education and e-learning, an interview with the popular movie company, Netflix and thoughts on AT&T’s reaction to the rumored Verizon iPhone. There is also a section on environmentally friendly technology. Both Mashable and TechCrunch are rated as top technology blogs. The reviews for the Kindle edition are great overall. Reading them on the Kindle makes them much more portable.